When a row is read or modified in a table containing LOB columns, the application will obtain a normal transaction lock on the base table. The actual values for (most) LOBs are stored in a separate table space from the rest of the table data. 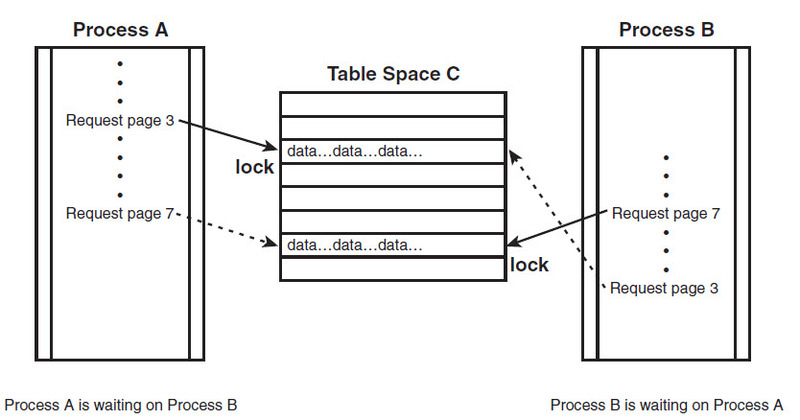 The locks on the base table also control concurrency for the LOB table space. But DB2 uses locking strategies for large objects, too. A lock that is held on a LOB value is referred to as a LOB lock. LOB locks are deployed to manage the space used by LOBs and to ensure that LOB readers do not read partially updated LOBs. Note: For applications reading rows using ISOLATION(UR) or lock avoidance, page or row locks are not taken on the base table. However, DB2 takes S-locks on the LOB to ensure that a partial or inconsistent LOB is not accessed. Note: Inline LOBs, available as of DB2 V10, are treated like normal data and do not require LOB locking. One reason LOB locks are used is to determine whether space from a deleted LOB can be reused by an inserted or updated LOB. DB2 will not reuse the storage for a deleted LOB until the DELETE has been committed and there are no more readers on the LOB. Another purpose for locking LOBs is to prevent deallocating space for a LOB that is currently being read. All readers, including “dirty readers” acquire S-locks on LOBs to prevent the storage for the LOB they are reading from being deallocated. S-locks, or SHARE: The lock owner and any concurrent processes can SELECT, DELETE, or UPDATE the locked LOB. Concurrent processes can acquire an S-lock on the LOB. X-locks, or EXCLUSIVE: The lock owner can read or change the locked LOB, but concurrent processes cannot access the LOB. S-lock, or SHARE: The lock owner and any concurrent processes can read and delete LOBs in the LOB table space. The lock owner does not need to take individual LOB locks. IS-lock, or INTENT SHARE: The lock owner can UPDATE LOBs to null or zero-length, or SELECT or DELETE LOBs in the LOB table space. Concurrent processes can both read and modify LOBs in the same table space. The lock owner acquires a LOB lock on any data that it reads or deletes. X-lock, or EXCLUSIVE: The lock owner can read or change LOBs in the LOB table space. The lock owner does not need to take individual LOB locks. IX-lock, or INTENT EXCLUSIVE: The lock owner and any concurrent process can read and change data in the LOB table space. The lock owner acquires an individual LOB lock for any LOB it accesses. SIX-lock, or SHARE WITH INTENT EXCLUSIVE: The lock owner can read and change data in the LOB table space. The lock owner obtains a LOB locks when inserting or updating. Concurrent processes can SELECT or DELETE data in the LOB table space (or UPDATE the LOB to a null or zero-length). As with transaction locking, there is a hierarchical relationship between LOB locks and LOB table space locks (see Figure 1). If the LOB table space is locked with a gross lock, LOB locks are not acquired. Figure 1. The DB2 LOB locking hierarchy. The type of locking used is controlled using the LOCKSIZE clause for the LOB table space. LOCKSIZE TABLESPACE indicates that no LOB locks are to be acquired by processes that access the LOBs in the table space. Specifying LOCKSIZE LOB indicates that LOB locks and the associated LOB table space locks (IS or IX) are taken. The LOCKSIZE ANY specification allows DB2 to choose the size of the lock, which is usually to do LOB locking. The ACQUIRE option of BIND has no impact on LOB table space locking. 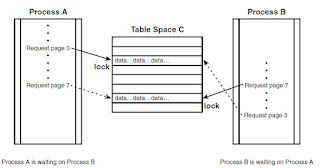 DB2 will take locks on LOB table spaces as needed. However, the RELEASE option of BIND does control when LOB table space locks are releases. For RELEASE(COMMIT), the LOB table space lock is released at COMMIT (unless WITH HOLD is specified or a LOB locator is held). LOB locks are taken as needed and are usually released at COMMIT. If that LOB value is assigned to a LOB locator, the S-lock on the LOB remains until the application commits. If the application uses HOLD LOCATOR, the locator (and the LOB lock) is not freed until the first commit operation after a FREE LOCATOR statement is issued, or until the thread is deallocated. If a cursor is defined WITH HOLD, LOB locks are held through COMMIT operations. 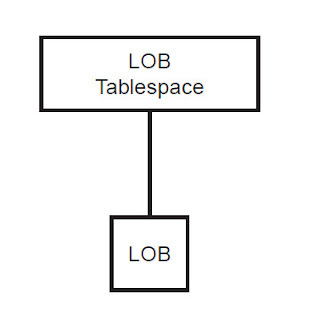 Under some circumstances, DB2 can avoid acquiring a lock on a LOB table space. For example, when deleting a row where the LOB column is null, DB2 need not lock the LOB table space. In today's blog entry, part 7 in our on-going series on DB2 locking, we will take a look at lock avoidance... as well as some other related things. Lock avoidance is a mechanism employed by DB2 for z/OS to access data without locking but also while maintaining data integrity. It prohibits access to uncommitted data and serializes access to pages. Lock avoidance improves performance by reducing the overall volume of lock requests. Let’s face it, the most efficient lock is the one never taken. In general, DB2 avoids locking data pages if it can determine that the data to be accessed is committed and that no semantics are violated by not acquiring the lock. DB2 avoids locks by examining the log to verify the committed state of the data. When determining if lock avoidance techniques will be practical, DB2 first scans the page to be accessed to determine whether any rows qualify. If none qualify, a lock is not required. For each data page to be accessed, the RBA of the last page update (stored in the data page header) is compared with the log RBA for the oldest active unit of recovery. This RBA is called the Commit Log Sequence Number, or CLSN. If the CLSN is greater than the last page update RBA (or LRSN in a data sharing environment), the data on the page has been committed and the page lock can be avoided. Additionally, a bit is stored in the record header for each row on the page. The bit is called the Possibly UNCommitted, or PUNC, bit. The PUNC bit indicates whether update activity has been performed on the row. The PUNC bit is checked if the CLSN test fails. For each qualifying row on the page, the PUNC bit is checked to see whether it is off. This indicates that the row has not been updated since the last time the bit was turned off. Therefore, locking can be avoided. 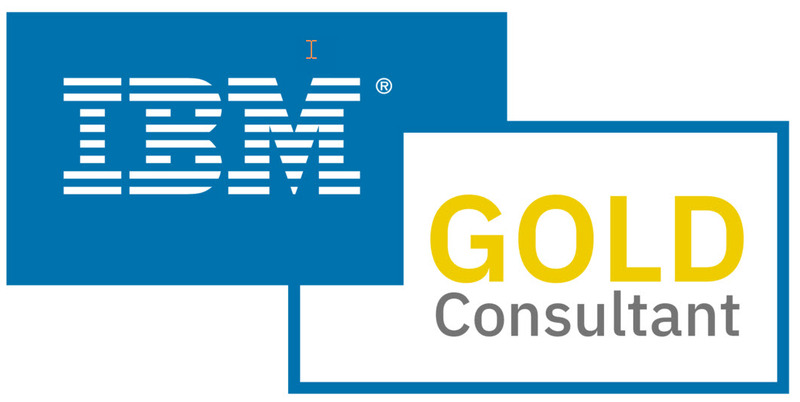 IBM provides no external method for you to determine whether the PUNC bit is on or off for each row. Therefore, you should ensure that any table that can be modified should be reorganized on a regularly scheduled basis. If neither CLSN nor PUNC bit testing indicates that a lock can be avoided, DB2 acquires the requisite lock. In addition to enhancing performance, lock avoidance increases data availability. Data that in previous releases would have been considered locked, and therefore unavailable, is now considered accessible. An ambiguous cursor is one where DB2 cannot determine whether there is intent to modify data retrieved using that cursor. The cursor is ambiguous if it is in a plan or package containing either PREPARE or EXECUTE IMMEDIATE SQL statements, along with the following conditions: the cursor is not defined with the FOR READ ONLY clause or the FOR UPDATE OF clause; the cursor is not defined on a read-only result table; the cursor is not the target of a WHERE CURRENT clause on an UPDATE or DELETE statement. You can also use the SKIP LOCKED DATA option with the UNLOAD utility. When you tell DB2 to skip locked data, then that data is not accessed and your program will not have it available. DB2 just skips over any locked data instead of waiting for it to be unlocked. The benefit, of course, is improved performance because you will not incur any lock wait time; however, it comes at the cost of not accessing the locked data. This means that you should utilize this clause only when your program can tolerate skipping over some data. The SKIP LOCKED DATA option is compatible with cursor stability (CS) isolation and read stability (RS) isolation; however, it cannot be used with uncommitted read (UR) or repeatable read (RR) isolation levels. DB2 simply ignores the SKIP LOCKED DATA clause under UR and RR isolation levels. In addition, SKIP LOCKED DATA works only with row locks and page locks. That means that SKIP LOCKED DATA does not apply to table, partition, LOB, XML, or table space locks. And the bigger the lock size, the more data that will be skipped when a lock is encountered. With row locking, you will be skipping over locked rows; however, with page locking, you will be skipping over all the rows on the locked page. Use this feature with extreme care, and make sure that you know exactly what you are telling DB2 to do; otherwise, you might be reading less than you want. Consider using this option in certain test environments or possibly even in production under the proper conditions. For example, perhaps you have a program that needs to read from a table like a queue to get a next number. If it is not imperative that the numbers be sequential, using SKIP LOCKED DATA can eliminate bottlenecks by skipping any locked rows/pages to get data off of the queue. DB2 10 for z/OS adds another interested nuance to locking with the option to use currently committed data. A common problem encountered by DB2 subsystems with poorly designed applications is frequent lock timeouts (and deadlocks). Under normal locking semantics, if data is locked an application requesting the same data would just wait until it becomes available, or timeout after waiting. As of DB2 V10, though, there is an alternative option for applications that cannot tolerate waiting on locks. USECURRENTLYCOMMITTED for the CONCURRENTACCESSRESOLUTION parameter. This clause applies only when the isolation level in effect is cursor stability (CS) or read stability (RS); otherwise it is simply ignored. The impact of this clause on the program is that DB2 uses the currently committed version of the data for applicable scans when data is in the process of being updated or deleted. Rows that are in the process of being inserted can be skipped. So, only committed data is returned, as was the case previously, but now readers do not wait for writers to release locks. Instead, readers return data based on the currently committed version; that is, data prior to the start of the write operation. Until next time... stay tuned for the next edition in the DB2 Locking series here at the DB2 Portal. DB2 augments resource serialization using claims and drains in addition to transaction locking. The claim and drain process enables DB2 to perform concurrent operations on multiple partitions of the same table space. Claims and drains provide another “locking” mechanism to control concurrency for resources between SQL statements, utilities, and commands. But do not confuse the issue: DB2 continues to use transaction locking, as well as claims and drains. As with transaction locks, claims and drains can timeout while waiting for a resource. Think of claims as usage indicators. A process stakes a claim on a resource, telling DB2, in effect, “Hey, I’m using this!”A claim is a notification to DB2 that an object is being accessed. Claims prevent drains from occurring until the claim is released, which usually occurs at a commit point. Claims prevent drains from acquiring a resource. A claim is acquired when a resource is first accessed. Claims are released at commit time, except for cursors declared using the WITH HOLD clause or when the claimer is a utility. A CS claim is acquired when data is read from a package or plan bound specifying ISOLATION(CS). An RR claim is acquired when data is read from a package or plan bound specifying ISOLATION(RR). A write claim is acquired when data is deleted, inserted, or updated. Like claims, drains also are acquired when a resource is first accessed. A drain acquires a resource by quiescing claims against that resource. Drains can be requested by commands and utilities. A drain is the act of acquiring a locked resource by quiescing access to that object. Multiple drainers can access a single resource. However, a process that drains all claim classes cannot drain an object concurrently with any other process. To more fully understand the concept of draining, think back to the last time that you went to a movie theater. Before anyone is permitted into the movie, the prior attendees must first be cleared out. In essence, this example illustrates the concept of draining. DB2 drains make sure that all other users of a resource are cleared out before allowing any subsequent access. A drain places drain locks on a resource. A drain lock is acquired for each claim class that must be released. Drain locks prohibit processes from attempting to drain the same object at the same time. A drain requires either partial control of a resource, in which case a write drain lock is taken, or complete control of a resource, accomplished by placing a CS drain lock, an RR drain lock, and a write drain lock on an object. You can think of drains as the mechanism for telling new claimers, “Hey, you can’t use this in that way!” The specific action being prevented by the drain is based on the claim class being drained. Draining write claims enables concurrent access to the resource, but the resource cannot be modified. Draining read (CS and/or RR) and write claims prevents any and all concurrent access. Drain locks are released when the utility or command completes. When the resource has been drained of all appropriate claim classes, the drainer acquires sole access to the resource. DB2 uses transaction locks to serialize access to a resource between multiple claimers, such as two SQL statements or an SQL statement and a utility that takes claims, such as RUNSTATS SHRLEVEL(CHANGE). Claims and drains serialize access between a claimer and a drainer. For example, an INSERT statement is a claimer that must be dealt with by the LOAD utility, which is a drainer. Drain locks are used to control concurrency when both a command and a utility try to access the same resource. It is vitally important that you design all your long-running application programs with a COMMIT strategy in mind. This means that after a period of execution, a COMMIT is issued. This guidance applies to read-only programs as well as to modification programs. Remember that claims are released at COMMIT, so a long-running read-only program that never commits can hold claims for extended periods, thereby causing concurrency issues, particularly for utilities (including online utilities such as REORG SHRLEVEL CHANGE). The LRDRTHLD DSNZPARM, introduced with DB2 V10, can be used to identify processes that hold read claims for extended periods of time. The parameter can be used to set a threshold that when met, causes DB2 to write a trace record. The default is 10 minutes. The longer a lock is held, the greater the potential impact to other applications. When an application requests a lock that is already held by another process, and the lock cannot be shared, that application is suspended. A suspended process temporarily stops running until the lock can be acquired. Lock suspensions can be a significant barrier to acceptable performance and application availability. When an application has been suspended for a pre-determined period of time, it will be terminated. When a process is terminated because it exceeds this period of time, it is said to timeout. In other words, a timeout is caused by the unavailability of a given resource. For example, consider the scenario depicted in Figure 1. 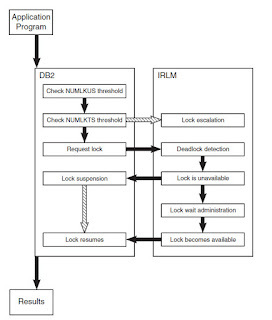 If Program 2, holding no other competitive locks, requests a lock currently held by Program 1, DB2 tries to obtain the lock for a period of time. Then it quits trying. This example illustrates a timeout. This timeout scenario is also applicable to row locks, not just page locks. The length of time a user waits for an unavailable resource before being timed out is determined by the IRLMRWT DSNZPARM parameter. You also can set this period of time by using the RESOURCE TIMEOUT field on the DB2 installation panel DSNTIPI. When a lock is requested, a series of operations is performed to ensure that the requested lock can be acquired (see Figure 2). Two conditions can cause the lock acquisition request to fail: a deadlock or a timeout. A deadlock occurs when Program 1 requests a lock for a data page held by Program 2, and Program 2 requests a lock for a data page held by Program 1. A deadlock must be resolved before either program can perform subsequent processing. DB2’s solution is to target one of the two programs as the victim of the deadlock and deny that program’s lock request by setting the SQLCODE to -911. This deadlocking scenario is also applicable to row locks, not just page locks. A graphic depiction of a deadlock is shown in Figure 4. 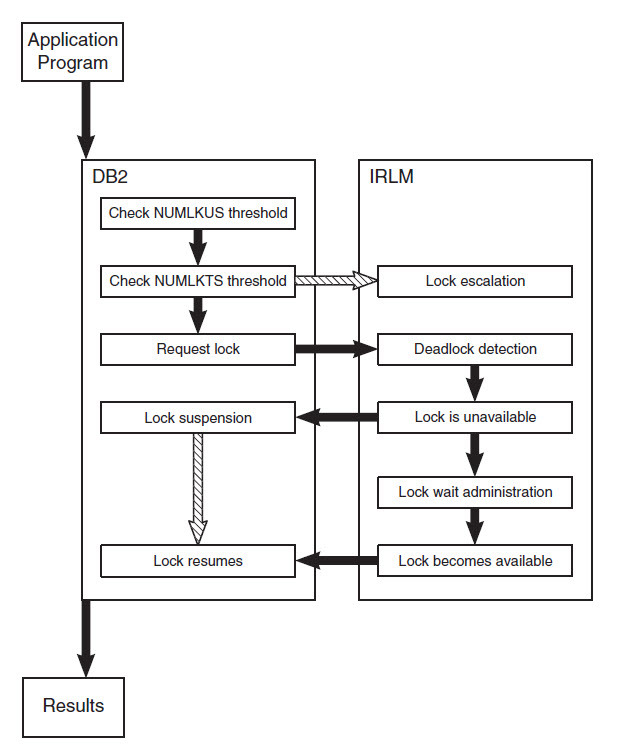 The length of time DB2 waits before choosing a victim of a deadlock is determined by the DEADLOK IRLM parameter. You also can set this parameter using the RESOURCE TIMEOUT field on the DB2 installation panel DSNTIPJ.